Then head down to Vienna for more amazing architecture and palaces, traditional coffee and cake and lots of shopping! Next, head across the border to Bratislava filled with baroque buildings restored to their former glory, with unique bronze statues all over the city and a castle perched over the city. Finally, end your journey in Budapest, straddling both sides of the Danube River, loaded with stunning architecture, thermal baths to unwind and great food. If you love to explore new cities, try new foods, enjoy the coffee culture and learning history along the way, then this is the perfect itinerary for you! PIN IT FOR LATER!! If you fly in and rent a car, then you will need to purchase a 10 day Vignette for around 12 € to be placed in your front windshield prior to driving on the highway. Directions are on the sticker where you need to place it! If you rent a car, then you will need to inform the rental car agency that you will be taking it out of the country to Slovakia, Austria and Hungary. More information on Vignettes for Europe here. Where to stay in Prague: Hilton Prague Hotel ⭐⭐⭐⭐⭐ – Within walking distance from the Old Town and all the main attractions, the Hilton Hotel is incredibly comfy and luxurious! Great for those who have a car and need private parking! Begin your morning by getting up early to take advantage of the entire day. 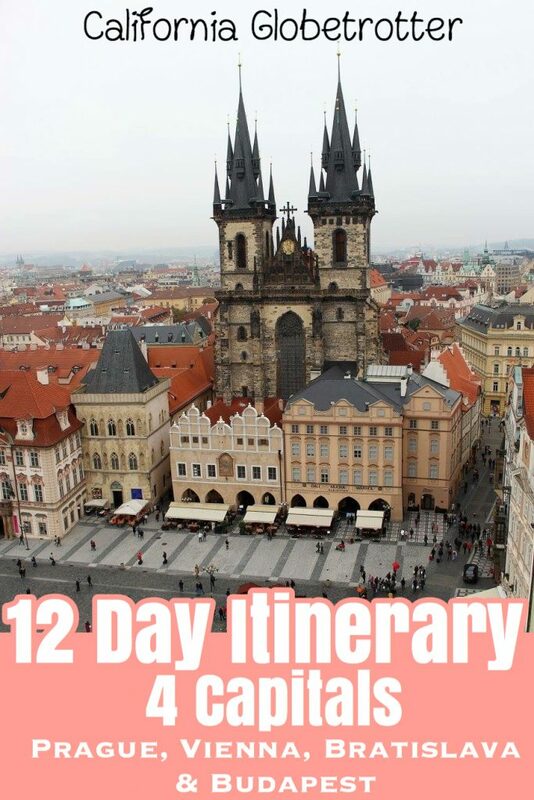 There are many, many things to do in Prague and you will want to see as much as possible! Head straight for the historic city center, where you’ll find the Old Town Hall & Astronomical Tower – one of the top attractions in Prague. Prague is known as the “Golden City of a Hundred Spires” and the best way to see them is to take the elevator up the tower for a view over Prague before the crowds arrive before visiting the Church of Our Lady before Tyn. If you’re wondering where to eat in Prague or what to eat, stroll through the allies full of shops and restaurants, grab yourself a Trdelnik (Chimney Cake) and stroll in the direction of the Charles Bridge and climb the tower the Staré Město Tower for amazing views over the river, bridge & castle. 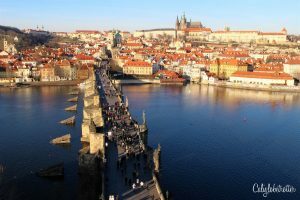 Then walk along the Vltava River heading in the direction of the Jewish Quarter and head over to the Jewish Quarter known as Josefov, where you’ll find the Old-New Synagogue, the Old Jewish Cemetery both of which a quick walk by is enough! Begin your day 2 in Prague by exploring the Malá Strana quarter on the opposite side of the Vltava River. Immediately after passing the Malá Strana Tower on the bridge, you’ll find the most picturesque street in Prague. Then turn down first the alley on the left and follow along till you find the John Lennon Wall – one of the main attractions in Prague and snap some peace loving pictures . 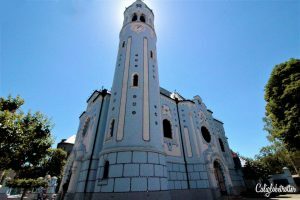 Then explore some of the churches in this area, such as the Church of St. Nicholas. Walk over in the direction of the Franz Kafka Museum and admire a plethora of beautiful swans at the Cihelna Park. To break up the drive a bit from Prague to Vienna, make a stop in Cesky Krumlov for half a day, since it’s only a 2 hour drive. You won’t want to pass up this picture perfect medieval town that is still perfectly preserved and was almost forgotten about! 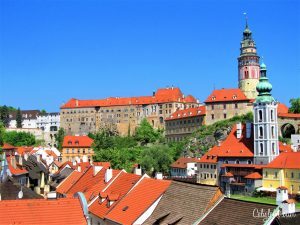 Cesky Krumlov is honestly the best day trip from Prague! End the day by driving the rest of the almost 3 hour drive to Vienna and explore the town by night after checking into your hotel, which I highly recommend! Where to stay in Vienna: Imperial Riding School Renaissance Vienna Hotel ⭐⭐⭐⭐ – For a more luxurious stay in Vienna, consider staying in a 19th century building, complete with antique style furniture minutes from the city center. Enjoy an elegant stay and a fancy breakfast to start your day! Vienna SportHotel ⭐⭐⭐⭐ For a more affordable stay and just a 7 minute walk from the nearest U-Bahn station and a 5 minute ride into the city center, the Vienna SportHotel provides comfortable rooms and affordable parking for those with a car! Before or after your sightseeing, come back and stay fit while traveling by playing tennis or working out in the gym. Perhaps you care to simply relax in the sauna or sit poolside! Just before you enter Austria, you will need to get a Vignette for 7 days (8,90 €), but there are no border controls so you won’t have to show your passport. Then work off those calories by walking around the Inner City, shopping here and there but heading in the direction of St. Stephan’s Cathedral. Be sure to check out the inside, as well as climb the tower for amazing views over the town. Take a gander inside St. Peter’s Church, stroll along the Graben. After all this walking, I’m sure you’ll want to sit down and enjoy another coffee and cake to recoup, so head on over to Demel, which is not technically part of the “coffeehouse” culture, but holds the title of “Purveyor to the Imperial and Royal Court”. 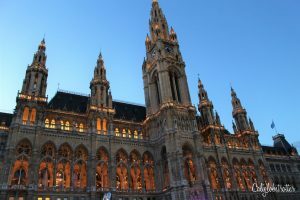 Then walk over to Vienna’s Parliament Building as well as the Rathaus (City Hall) – one of the top attractions in Vienna. If you’re in town during the winter, why not make time for some ice skating? Across the street, you’ll find Cafe Landtmann for more coffee and cake! Spanish Riding School – catch a performance of the of the circus-style training of the horses with their riders wearing traditional uniforms. Volksgarten – take a stroll through the gardens near the Hofburg Complex which were created after Napoleon destroyed the city walls in 1820. Parliament Building – Take a gander of the Austrian Parliament building which depicts the last Austrian Emperor Franz Joseph I handing the constitution to the people of the Empire. Since you’re this far out of the inner city, you might as well visit the Prater, a fun fair open to the public where you can take a ride on the Riesenrad, the historic Ferris wheel built in 1896. After all that fun, as you’re heading back into town, stop at Café Schwarzenberg for more coffee and cake, if you’re not already hyper on goodies from the Prater. 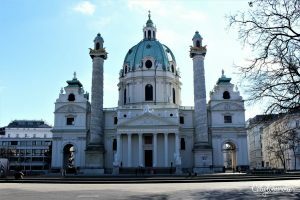 Then visit Karlskirche, a unique looking church with two minaret-like towers. Praying that the weather is nice for you, spend the day between the two palaces. 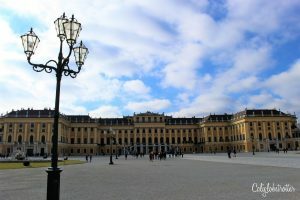 To avoid crowds, visit the Schönbrunn Palace first and take a self-guided audio tour and then stroll the palace grounds. Plan on spend a good couple of hours here perusing the castle and gardens. Schönbrunn Palace was once the imperial summer residence of the Hapsburg monarchy and is today one of the best things to see in Vienna. Stop by the Belvedere – a summer residence with stunning gardens and the iconic portrait from Gustav Klimt of The Kiss which is an absolute must-see, as it’s one of the symbols of Vienna. Prior to crossing the border, you’ll need to purchase a Vignette for Slovakia 10 days (10 €) and place it in your window, which allows you to drive on the highways. 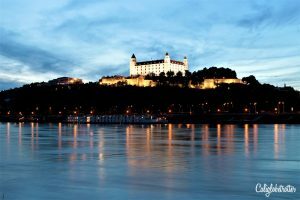 Bratislava is a hop, skip and a jump away from Vienna and it would be silly to leave this off your itinerary! You could easily see the entire Old Town in a day if you want to cut out a day. But it’s best explored in two days to break up all the walking you will be doing as there are many things to do in Bratislava. The next day, head early to the Church of St. Elisabeth “Blue Church” and you can visit the inside of this Gaudi-esque church. I promise it’s worth the 10-15 minute walk! If you’re looking for a unique experience in Bratislava, then once back in town, enjoy a coffee and cake at Konditorei Kormuth, a beautifully restored cafe with antique chinaware, furniture and stunning artwork. Afterwards, walk it off by strolling through the alleys, checking out the Slovak National Theater and making your way across the Danube River to the Sad Janka Kráľa Park for a lovely view of the Old Town, SNP Bridge and the Bratislava Castle. End the evening by having dinner up at the Observation Deck UFO, a tower in the middle of the SNP Bridge which offers stunning panoramic views over Bratislava! You’ll also need to buy another Vignette for 10 days (15 €) in order to drive on the highways in Budapest. As Budapest is only a mere two hour drive from Bratislava, you’ll be able to take advantage of a full day of sightseeing. 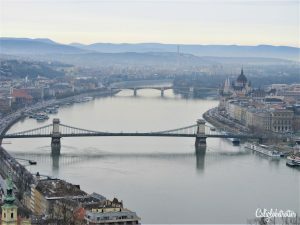 As Budapest is actually “a tale of two cities”, Buda and Pest, we’ll begin with Buda. Hopefully you booked a room at the Hilton Budapest, a personal favorite as it’s in the heart of the Castle District and offers the best views over Budapest and the Fisherman’s Bastion is right there! I would hang out here early in the morning before the crowds arrive as this is a popular tourist destination in Budapest, as well as late at night for amazing night time views over Budapest and Parliament. Next visit the Mátyás Church, just feet from the Fisherman’s Bastion and admire the colorful tiled roof. Then you can either walk around the Budapest Castle or consider visiting the Hungarian National Library. When done with the Castle District, take the historic Budapest Castle Hill Funicular down into the city. 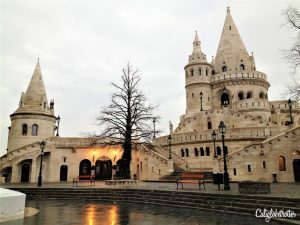 Where to stay in Budapest: Hilton Budapest ⭐⭐⭐⭐⭐ – Just inches from the Fisherman’s Bastion, the Hilton Budapest is in a PRIME location with views to kill for! Rooms are luxuriously and comfortably furnished and a portion of the Dominican cloister have been incorporated into the hotel! 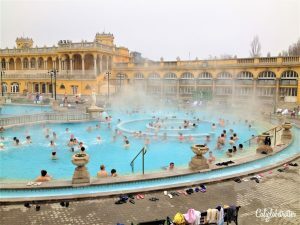 Budapest is known for their beautiful thermal pools, so I highly suggest visiting Széchenyi Thermal Bath which is one of the best thermal pools in Budapest located in near Hero’s Square. You should visit first thing in the morning, otherwise you’ll have a hard time getting in. Don’t worry, you can completely get dressed and showered there before continuing your sightseeing. I highly recommend spending a good two hours here to really be able to enjoy the thermal pools. Once dressed, head through the parks to visit the Millennium Monument which dominates Hero’s Square. The just a short distance from here, walk over to another major tourist attraction in Budapest, the Vajahunyad Castle, which is not a genuine castle, but a complex of buildings reflecting the different architectural styles in Budapest that was created for the 1896 Millennium Celebrations. Memento Park – a park dedicated to a collection of Socialist Realism sculptures from the 20th century that Hungarians preserved to the time that Communism was once the form of government here. Buda Hill – At the top of Janos Hill stands the Erzsebet Look-Out Tower. Begin your day by visiting the Citadel, a place which once inspired terror, now offers restaurants, a wine bar and a splendid view over Budapest. Then follow the trail to the Statue of St. Gellért who is the patron saint of Budapest. If you’re feeling like another dip and relax your feet, then visiting another popular thermal pool, the Gellért Hotel & Bath Complex is a must. Once done, head into the city in the direction of St. Stephen’s Basilica via a detour to Mihály Vörösmarty Square where you’ll find the elegant Gerbeaud patisserie where you can stop for a coffee and cake which opened in 1858. Then continue on to St. Stephen’s Basilica which is dedicated to the first Hungarian Christian King, designed in the Neo-Classical style. Not far from here is the State Opera House, which I highly recommend visiting the timeless Opera room which was built to rival those of Vienna, Paris and Dresden. Now that you’ve had a wonderful two weeks, I’m sure you’re excited to head home and lay your head on your familiar pillow, so I’ll wish you a safe journey home! During the Spring and Autumn months, you’re less likely to encounter hordes of tourists as compared to during Summer and the Christmas Market season. The weather is pleasant, give or take a few rainy days. The summer months are obviously the best time to go for better weather, but the cities are much more crowded. Not really, however, if you have already been to Cesky Krumlov, then I would swap it out for České Budějovice, also near the former.Plus, you need less time here than at Cesky Krumlov, in case you’re running short on time. 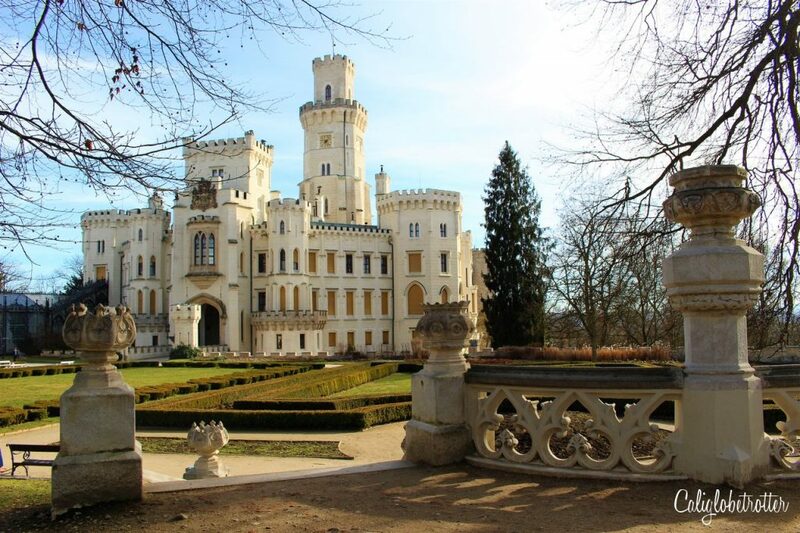 Before arriving in České Budějovice, I would stop at Hluboká Castle, about 10 minutes drive outside the city for an amazing Neo-Gothic style castle, modeled after Windsor Castle in London. Once you arrive in the town, you’ll find the original Budweiser Brewery (Budvar Brewery) where you can take a tour of the brewery and try a sample of their beer at the end of the tour. 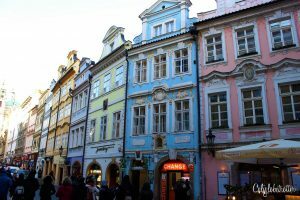 While it is easy to get around by train, I highly recommend renting a car as it would be such a shame to miss the smaller towns of Cesky Krumlov or České Budějovice. Plus it gives you more freedom to come and go when you want, and the drive is incredibly beautiful and the highway is easy to navigate. And eat lots of cake! This is a great itinerary! We followed it almost to the letter a few years ago, although we skipped Bratislava, which I wish we didn’t. But we also had to get to Romania after Budapest, so had a little less time. Budapest is pretty much of a home-base for us usually, but it is always a great place to revisit. And we all loved both Prague and Vienna. 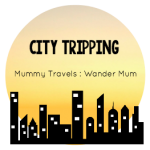 You compiled a great travel guide for these cities! Thanks for the post, reminded me of some good times in them. Oh awesome! Glad to take you down memory lane! If you get he chance, I highly recommend visiting Bratislava! I just published that last week! How exciting to read this! This is my exact itinerary for my next trip. Thanks for the tips! Thanks – very useful tips. Love all the hot springs there too! I have done Prague, Vienna and Budapest (we were travelling around Europe by train) – we started in Rome with Prague the final destination. I haven’t been to Bratislava though it would have been good to add into the itinerary! Which did you like the best? Oooh tough choice! Vienna is special bc my husband proposed there, but Prague is allllways amazing but so is Budapest but Bratislava is a little less touristy, so it’s hard to say which one I prefer best! I just love how close these cities are, because they really are a great 4! I travelled between them by train and it was so easy, I love European train travel! You definitely hit a lot of the places we did on our Christmas market adventure so I agree with your recs!! I’m definitely in agreement that driving seems to cover the distance more effectively. We live in Germany so we drove everywhere anyways but many car rentals allow you to return the car at another location. 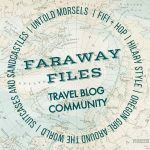 I’ve been to all of these cities, except for Bratislava, but would totally go back with this itinerary! I came for the pictures & they’re gorgeous! I’m so glad you mentioned the baths in Budapest. They were my favorite part of that beautiful city. Plus the food. And the architecture. And the nightlife. lol. Prague would be great for a bachelorette party but Bratislava is also popular for Stag parties! This is quite the jam packed itinerary but what a great way to see so many places. I love this part of Europe, Budapest is one of my favourite destinations ever. 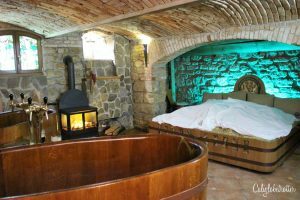 I just loved the architecture – and the baths! I’ve never been to Bratislava but it looks fabulous. One day! Gosh you have been busy, creating this itinerary. Out of the four, I’ve only been to Vienna so I have a lot to catch up on some day! Hoping to cover Vienna this year! Be sure to check out my Vienna post as well as my Guide for Coffee and Cake post for Vienna! Fantastic! Such a great idea. Followers don’t have to do a thing but book and go. Since I live in Vienna’s I’ve been to all of those cities in seperate trips but absolutely looove your idea to combine all 4 cities. I’ll absolutely have to save this itinerary for when friends from overseas are coming over to visit me in Vienna. Perfect way to show them around a little! Beautiful itinerary! I’m going to be in Vienna in fall this year too. I’ve never been to a spa in Europe. It seems I’m missing a lot. My trips are always so rushed. I’d love to be able to relax a little when I travel, but with my husband that’s very difficult. He is always running around. Your post reminded me how Beautiful Budapest is. Im that way too, always go, go, go but I always try to make time for something relaxing! This is quite an ambitious itinerary, but looks like you hit all the good stuff! I’ve been to all these capital cities but didn’t get to do everything on your list. When I was in Vienna, the most important item for me was the Vienna Zoo :P. And I really enjoyed just hanging out in the grand cafes in Budapest! Haha yes lots of cake!! 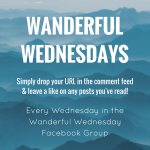 I really enjoyed reading this post! We did something similar three years ago and stayed at the Hotel Devin in Bratislava. We are headed to some of these spots later this year, so this is really helpful! Saving this for later – thanks for the perfectly timed post!! Eastern Europe is still on my list to go! And I love your itinerary cause it gives me great ideas on what to do in those beautiful cities. Very interesting tour! I specially love the room in the Prague Spa. We’ve only been to Vienna (together) and Prague (Dídac only). Budapest and Bratislava are in our bucket list. Thanks for this useful post! Amazing! I haven’t had the chance to visit any of these places (and trust me, they are all my list) so this is an ideal itinerary for someone like me who can probably only get away from work for about two weeks at a time. Thank you so much for sharing. Definitely pinning this one for later! Hubby and I have never been to any part of Europe! However, I always dream of it. Though I’ve always wanted to go to the most popular places, lately I’m starting to wanderlust over places in Europe that seem much more authentic and enjoyable, like these one. The architecture of the buildings in your pictures are simply stunning and the reason I dream so much about Europe! We’d definitely go with the car option since it’s so much nicer to go anywhere with a car! A car is really the best way to go!! 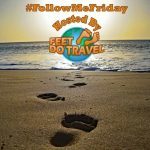 Some good solid tips and yes there’s so much to see in Europe its hard to fit it all into one trip! I love Bratislava Castle and wouldn’t mind returning there one day. The Beer Spa looks so cool! 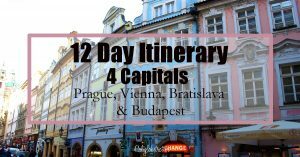 From all of these capitals I haven´t been to Bratislava yet – loved the way you´ve put the itinerary! 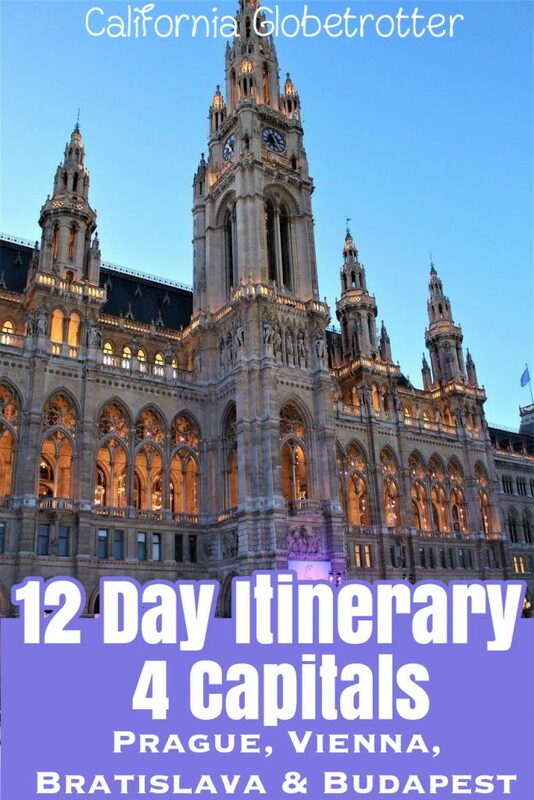 12 days is a great length of time to explore these cities and have time left over to do some awesome day trips. Budapest and Prague would be my favourites – I loved the food and beer there! Haven’t tried the beer spa yet though – something for the next visit probably! It’s a lot of fun with a group! You can have between 2-6 people! Wow, what an amazing itinerary! I’ve only been to Prague, but I’ve been dying to go visit those other cities, so this might come in handy for me soon! Thanks for all of the great information. That beer spa in Prague really caught my eye, what a cool experience! Highly recommended! The beer spa is fun for everyone!